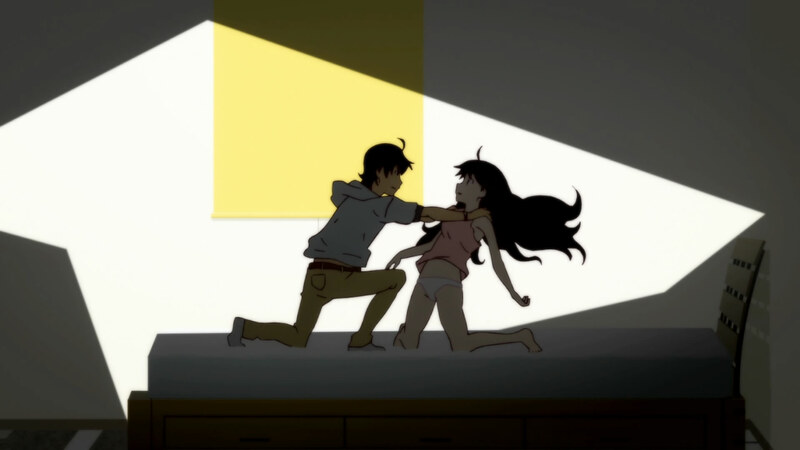 Continue Reading "Nisemonogatari – 11 (END)"
In this penultimate episode, we learn that just about everything in Araragi’s life has turned out to be a fake – even his own sister turns out to be an imposter. NisiOisiN wasn’t kidding around when he named this installment in the Monogatari series – there are falsehoods and fakes in every nook and cranny of the story. At least the donuts are still real! Continue Reading "Nisemonogatari – 10"
Still no sign of Tsukihi or a phoenix, but an amagami, some nishishishis, and two new mysterious and dangerous strangers go a long way towards making up for it – I said, with a posed look. Continue Reading "Nisemonogatari – 09"
I will never look at a toothbrush the same way again. Continue Reading "Nisemonogatari – 08"
This finale to Karen’s arc was filled with plenty of action, but instead of it being completely of the wordplay variety, there was actually a good old fashioned brawl too – just not between whom I expected it to be. Continue Reading "Nisemonogatari – 07"
Continue Reading "Nisemonogatari – 06"
Continue Reading "Nisemonogatari – 05"
Kiss-shot Acerola-orion Heart-under-blade 「キスショット・アセロラオリオン・ハートアンダーブレード」, where have you been this whole time? Continue Reading "Nisemonogatari – 04"
The Eye of Horus, a symbol of ancient Egypt representing protection, royal power, and good health, is originally personified by the goddess Wadjet – but a more modern day personification would be the tsundere goddess Senjougahara Hitagi. Continue Reading "Nisemonogatari – 03"
If this were any other show, the fact that we’ve only inched slightly closer to learning Karen’s involvement would be quite disappointing – but Nisemonogatari is no ordinary show. Continue Reading "Nisemonogatari – 02"
If your taste in action runs more towards wordplay rather than swordplay or gunplay, then the premier episode of the sequel to Bakemonogatari is right down your alley. Continue Reading "Nisemonogatari – 01"